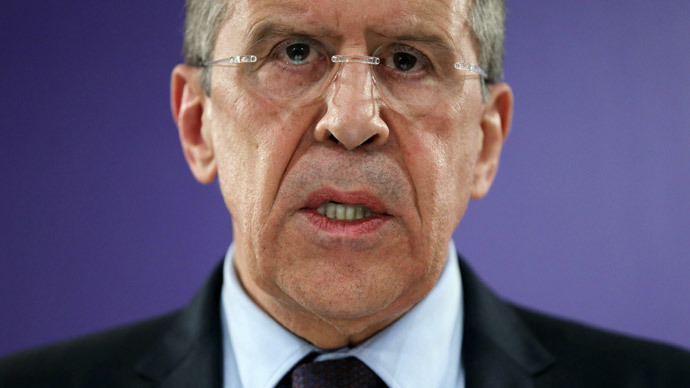 There is no intention in Moscow to send its troops into eastern Ukraine, Russian Foreign Minister Sergey Lavrov said. Hopefully, the growing understanding in the West of Russia’s position will allow for a de-escalation of the tension, he added. In an interview with Rossiya 24 TV channel, Lavrov spoke on the futile western attempts to isolate Russia diplomatically, the growing acceptance of the need for constitutional reform, which Moscow proposes, the prospects of NATO’s expansion into Ukraine and the potential for global presence of the Russian Navy. Question:After the G7 countries announced their decision to withdraw from the G8, it was said that now Russia is isolated in the international arena. 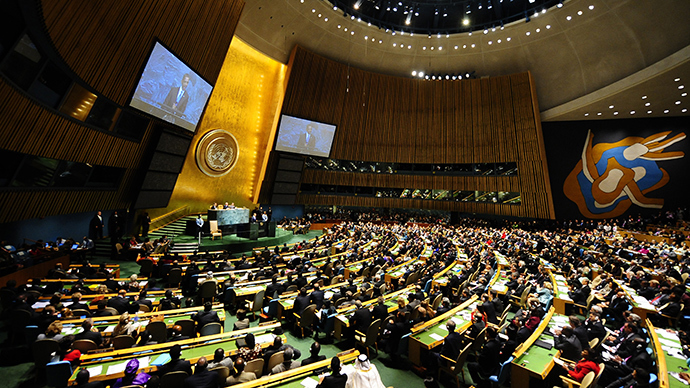 In the UN General Assembly 100 countries voted against Russia. The claim of Russia being isolated is true, then? Sergey Lavrov: “Isolation” is a term invented by our Western partners who act with nostalgic neo-imperial ambitions in mind. The instant something isn’t to their liking they draw out this sanctions stick. The times when such strategy could be employed are long gone. They should think about getting everyone, with no exceptions, to work together, not about isolating their partners. I’m surprised at how obsessively they’re trying to – create rather than find – proof of Russia’s isolation. I’ve seen a lot in my time, but for major countries to use all their diplomatic resources to twist the arms of the entire world, including our closest partners, in order for them to agree with the argument about Ukraine’s territorial integrity while ignoring the rest of the principles outlined in the UN Charter? I was astonished with the alacrity. Key government institutions expend so much effort on this. It’s the case with the UN General Assembly vote. Such results are achieved by a combination of several means. First, our Ukrainian neighbors were advised to keep the tone of their draft resolution non-confrontational and level-headed, to send a positive message of the need to respect Ukraine’s territorial integrity. Who would oppose that? But that’s not even half of the truth, it’s just a sliver of it. You and our viewers understand what I’m talking about. Then, some countries that are naïve enough for it are told, “Look, it’s such a great resolution, why don’t you sign it and become a co-sponsor.” The more experienced ones who realize what’s really going on are approached with, “If you don’t support this resolution, there will be consequences.” And then they describe these consequences. We know about that. Our colleagues come to us and confide why this or that relatively small country has to cave in. For example, they were told contracts would not be signed or political dividends would be withheld. If we take into consideration that the West in the broad sense, including Australia, New Zealand, Japan etc., amounts to about 40-something countries, basically 50 states were forced or somehow persuaded to do it. We hold no grudge against these delegations. It will not affect our relations with them. I can’t but point out another number: about 70 countries refused to support this resolution. Q:And if we count the countries who didn’t cast a vote that would make it 93. SL: So basically it’s a tie. The Western propaganda machine – there’s really no other way to call it – will hail it as a great victory in the media, but we know the value of this victory. Q:100 countries voted against Russia. The number of countries that voted for Russia abstained or didn’t cast a vote comes up to 93. This includes the brave countries that, despite the pressure, made this choice. SL: This is no doubt a brave thing to do. It’s not anti-Western or anti-Ukrainian. It reflects a deep understanding of what’s going on the part of the countries who didn’t vote in favor and especially those who voted against. This wasn’t about territorial integrity or Ukraine at all. Q:Three weeks ago, on our program, Russian Ambassador to the UN Vitaly Churkin said that Russia expects to see moral support from China. China abstained from voting on the resolution. After that President Obama and President of China Xi Jinping held a meeting, during which, as my Western colleagues told me, the Americans were trying to persuade China to scrap gas supply contracts with Russia. And then you met with Xi Jinping. So what is China to Russia? SL: China is a very close partner of Russia. In our joint documents our relations are defined as comprehensive strategic partnership of cooperation. All of China’s actions reaffirm its commitment to the principles we agreed on. If, as you say, the Americans did try to convince China to review its economic agreements with Russia on the highest level, it’s an off-the-scale naïve or brazen attitude. I would even say that not understanding the essence of Chinese politics and mentality is just inexcusable for the officials in charge of such negotiations. At the very beginning China said that it takes into consideration the combination of historical and political factors. China strongly opposed using non-diplomatic measures and threats of sanctions to resolve this problem. Our contacts with our Chinese partners show that they not only understand Russia’s rightful interests in this case, but are also hand-in-hand with us in the understanding of the initial causes of the current crisis in Ukraine. There is no doubt about it. President Putin and President Xi Jinping spoke on the phone. On March 24, I met with President Xi Jinping on the sidelines of the Nuclear Security Summit in The Hague. BRICS foreign ministers held talks as well. Q:Did BRICS work out the joint statement in The Hague? SL: It’s the chairperson’s statement, which the Foreign Minister of South Africa delivered after our meeting. Q:Last Saturday we informed our viewers that the OSCE agreed on the mandate of a mission to be sent to Ukraine. Why did Russia object to it initially? What’s the mission going to work on? SL: I would say that it was our Western and Ukrainian partners that initially objected to this mission. 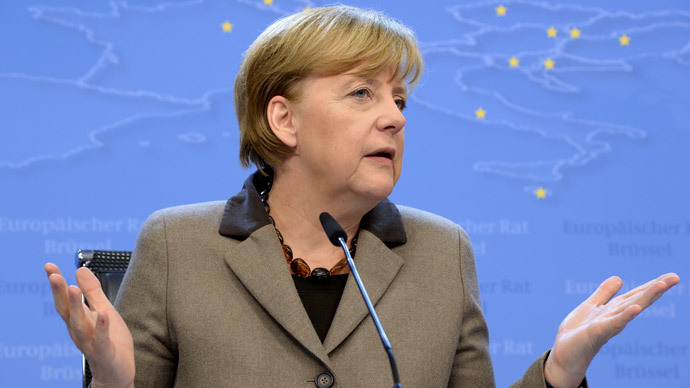 Q:But as usual it was presented the other way around – Russia against the rest of Europe. SL: We’re used to that. Orwellian talents are still widely used. Russia was willing to send the OSCE mission a week before the decision was finally made. Even though everything was clear by then, our partners demanded with inexplicable determination for Crimea to be included in the mandate as part of Ukraine. One can completely disagree with our take on the situation, one can refuse to recognize the decisions made by Russia based on the will of the Crimean people and supported by an overwhelming majority. We understand that, it happens. But it’s just diplomatic impudence or complete diplomatic incompetence to fail to comprehend the real political situation and the utter uselessness of their demands after we said we would recognize any outcome of the referendum in Crimea, telling us that despite what the President said the mandate of the mission should include Crimea as part of Ukraine. Q:Moscow was insisting that the mission should go to western regions of Ukraine as well as eastern. Was that achieved? SL: Taking into consideration our Western colleagues’ well-proven talents to twist words and interpret provisions, we were insisting that cities and regions be listed in the mandate instead of it just saying “mission to Ukraine.” Of course the list includes cities situated both in western and eastern parts of Ukraine, but none situated on the territory of the Republic of Crimea of the Russian Federation. Q:Maybe then what we see is some progress not only in terms of sending an OSCE mission to Ukraine, but also new Ukrainian authorities, their legitimacy aside, dealing with the Right Sector problem, as evidenced by the last 36-48 hours. SL: It’s taken them too long, though it’s true that [it’s] better late than never. Over a month ago I raised the issue of the Right Sector and the necessity to dissociate from the radical forces with our Western partners. I asked them a very simple question: “If you agree that we need to defuse the situation, why won’t you publicly say what the Right Sector really is?” Same to a degree goes for the Svoboda party, whose platform references The Declaration of June 30, 1941, which expressed support of Nazi Germany and its efforts to establish a new world order. According to the party’s charter, it’s still committed to this principle. Our colleagues reacted quite strangely to our requests to at least publicly express their opinion on these forces and exert their influence on the people in Kiev who claim they’re the new authorities so that they do the same. At first they avoided the issue, and then at one of the recent meetings, I think it was in London, US Secretary of State John Kerry told me that after close scrutiny they concluded that the Right Sector was trying to become a political movement. The subtext was that it’s a good thing, and Svoboda is moving towards [the] mainstream. That’s a quote. A lot of people were present at the meeting, so I’m not revealing a secret here. 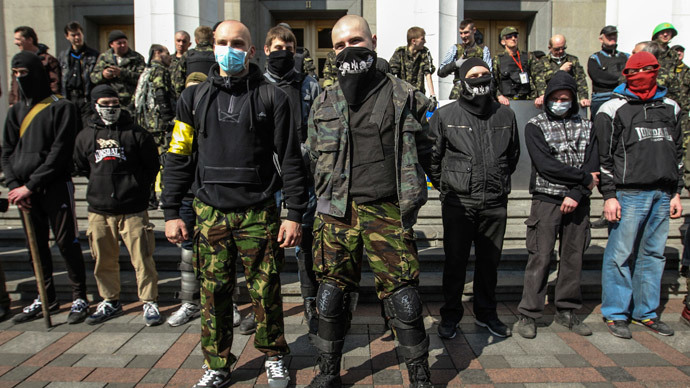 I was giving examples of the opposite trend concerning these groups, starting with their urging the public to shoot Russians in the head and kill them, calling Russians names, and all the way up to the beatings that take place even in the eastern parts of Ukraine where the members of these groups consider themselves at home. As for what’s been happening in the last few days, let’s hope that the Ukrainian government’s statements and steps are the result of some awareness campaign conducted by our Western partners. Like I said, better late than never. Let’s see what comes out of it and whether those in power manage to bring to heel the people they relied on to get their current positions. 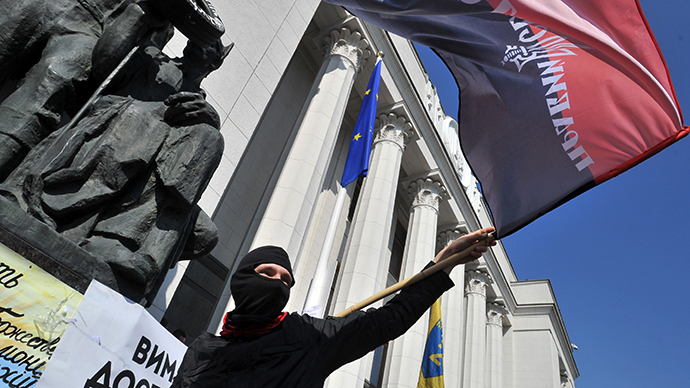 The recent events, that is, when the Right Sector surrounded the Verkhovna Rada [Ukrainian Parliament] building again and demanded for the Interior Minister to be sacked because of [Right Sector leader] Sashko Bilyi’s death, are very telling. 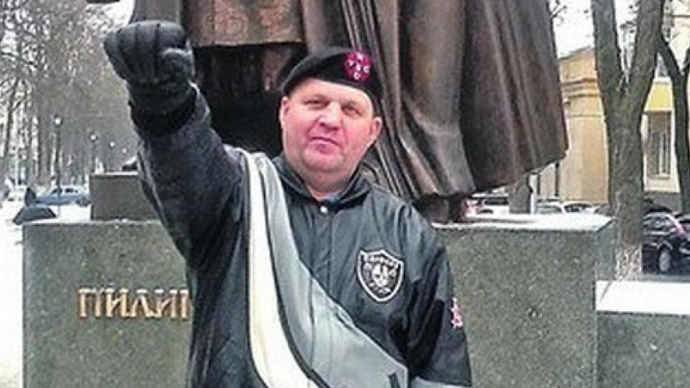 Whatever one might think about the circumstances of his death, which, like in any such case, should be investigated thoroughly, one can’t fail to notice the moral boost his death gave to the people wearing Right Sector colors who follow the principles we all know about. It’s a very alarming signal. It surprised me that while Russian television, including your channel, showed the siege of the Verkhovna Rada and commented comprehensively on the events unfolding between the Right Sector and the members of parliament, on their possible ramifications, Euronews hasn’t said a word about it, with Ukraine mentioned in the context of the IMF deal in the third or fourth news piece. Sadly, this kind of coverage is also telling. We’ll try to establish the truth through channels alternative to mainstream Western media. I hope that your alternative channels become the mainstream. Q:Alternative channels – that’s another matter, since Ukrainian cable providers were banned from transmitting Russian TV channels. At first, the OSCE condemned it. As far as I understand, this issue was raised even at your talks with the Western partners. Then it was slowly moved towards the bottom of the priorities list. As the OSCE representative said, there are national interests that allow for TV censorship. SL: Yes, Dunja Mijatović said that. Let’s just say that being the OSCE Representative on Freedom of Media, she should show more freedom in her judgments. It’s lamentable that excuses are made for banning Russian channels. Who could imagine that channels can be banned if it’s done for protecting fundamental values? However, Ms. Mijatović dismissed in the past our numerous appeals that demonstrations with fascist and neo-Nazi slogans held in a number of the OSCE countries were unacceptable, citing freedom of speech. So in Ms. Mijatović’s opinion four channels are more dangerous than neo-Nazi demonstrations in the Baltic states and a number of other countries, including Germany. Q:What kind of a compromise with the West is possible? Russia is on one side of the line, and the US and the West are on the other, so which points can you agree on with your colleagues? SL: I don’t believe we’re divided by that strict a line. We’re working on aligning our positions. Based on my latest meeting with Secretary of State John Kerry in The Hague and my contacts with Germany, France and a number of other countries, I can say that there’s a possibility of drafting a joint initiative that we could offer to our Ukrainian colleagues. It’s a very important consideration, because up until now our partners have been offering to set up a contact group within the framework of which Russia and the people who seized power in Kiev would negotiate under their supervision. Such a platform is absolutely unacceptable, and that’s not even the issue. What’s happening in Ukraine now is the result of the deep crisis in the political system, triggered by the inability – I wouldn’t want to accuse anyone of deliberately avoiding it – of each successive leader to reconcile the interests of the western and southeastern regions of Ukraine. It can’t go on like this. We are convinced that Ukraine needs a fundamental constitutional reform. To be honest, we see no other way that would ensure Ukraine’s sustainable development except becoming a federation. Maybe someone knows better, and there’s a magic formula that would make a unitary system of government work in a state where in western, eastern and southern regions people celebrate different holidays, honor different heroes, have economic structure, speak different languages and think differently and gravitate towards different European cultures. It’s tough to live in a unitary state like that. That’s why on March 10 we gave an unofficial document outlining our vision to our American, European and Chinese partners and other colleagues, including BRICS countries. SL: No. First of all, it states that the most urgent task is to stop the violence of armed groups, disarm militants and free all illegally seized buildings – which hasn’t been done yet – as well as squares, streets, cities, towns and villages. First and foremost we mean Maidan. It’s just a disgrace for a European country and one of the most beautiful cities in Europe to have this kind of thing for half a year, and in front of Western visitors besides. We’re told Maidan will stay until presidential election take place, with the outcome that satisfies Maidan. It’s a disgrace for all who put up with it. We proposed to start with sorting out these issues, especially since it was a responsibility Mr Klichko, Mr Yatsenyuk, and Mr Tyagnibok assumed when they signed the document along with the German, French and Polish foreign ministers. Another thing we proposed was to begin a comprehensive constitutional reform right away, with all political forces and regions having an equal say in it, to discuss establishing a federation, which would grant every region wide powers in the spheres of economy, culture, language, education, economic and cultural ties with neighboring countries or regions and guarantee minority rights. Taking into consideration the number of ethnic Russians living in Ukraine, we propose and we’re convinced that there’s no other option – and a few presidential candidates said so on numerous occasions – but to make Russian language the second official language of Ukraine, and ensure the rights of minorities in every constituent entity in accordance with the European Charter for Regional or Minority Languages. Q:There are Hungarians and Romanians living there as well. SL: Hungarians, Czechs, Germans – they are all complaining to the governments of their countries that they are no longer comfortable living in Ukraine. Czechs even wanted to go back home but the Czech government said, “No, we looked at the conditions you live in and we think you are fine.” This indicates that they care more about geopolitical matters and political expediency than about human rights. A constitutional reform should be approved by a referendum. It should take into account the interests of all the regions. And once this constitution is approved by a nationwide vote, there should be a presidential and parliamentary election; new legislative assemblies should be elected in all the regions; and there should be new governors. Governors should be elected, not appointed. Eastern and southern regions insist on that. We strongly believe this is the right way to go. In response, we are told through the Ukrainian Foreign Ministry that Russian proposals are a provocation and that we are meddling in Ukraine’s internal affairs, because our ideas are inconsistent with the foundations of the Ukrainian state. Which ideas? First, federalization, and, second, Russian as the second official language. I don’t see how this is inconsistent with the foundations of the Ukrainian state. Q:Do Western partners hear these proposals? SL: They do. I can tell you that “federalization” is definitely no longer a taboo word in our talks. I really believe we should insist on it – not because it is our whim but because southern and eastern regions want that. Q:Do you expect that these ideas will eventually reach Kiev, at least through Western capitals? SL: That’s what I count on, because the current Ukrainian government can hardly be suspected of being independent. Q:Do Moscow and, say, Washington talk about Ukraine’s non-bloc status? SL: This idea is present in our proposals. We definitely think that the new constitution should clearly say that Ukraine cannot be part of any bloc. SL: They hear that and you can tell whether they understand it or not by listening to their public statements. Speaking in Brussels last week, President Obama said that neither Ukraine nor NATO were ready and that there was no point talking about that. 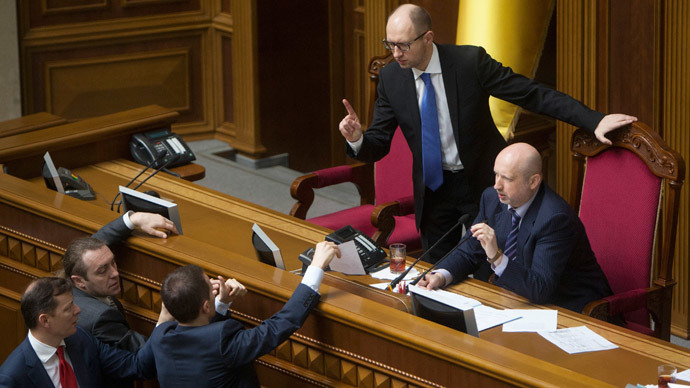 Q:By the way, Yatsenyuk says he is not considering this option at this point. SL: “At this point.” We are convinced there can be no ambiguity on this issue. There are too many of those caveats – “at this point” and “no intention.” Intentions can change, and you end up facing new facts on the ground. Q:Especially in the last couple of months. SL: Not just in the last couple of months – in the last 25 years. We are told that the West keeps extending a hand of friendship, and Russia keeps choosing a zero-sum game. A few days ago, my colleague, British Foreign Secretary William Hague, published an article, in which he writes that Russia faces global isolation again, because, he says, you come to Russia with open arms and it turns away and pursues zero-sum mentality. But that’s totally unfair. On the contrary, we are always eager to engage in fair partnership. This is reflected in our proposals on indivisible security, which should be the same for everybody. It is wrong for NATO members to be protected with indivisible security and for everybody else to be treated as second-rate nations, so NATO can act as a magnet to attract new members and keep pushing the dividing line further to the east. SL: Speaking of zero-sum games we are being accused of, the EU Eastern Partnership project from the very beginning was based on the “either-or” concept: either you’re with us or you’re against us. Actually, our Western partners have been talking about this since the 2004 election in Ukraine. Back then, there was no Customs Union and no Eastern Partnership; there was an unconstitutional, artificially invented third round of the presidential election. Karel de Gucht, who then was the foreign minister of Belgium and who is now, by the way, the EU Trade Commissioner, publicly demanded that Ukrainians should vote and decide whether they want to be with Europe or with Russia. This is where such mentality comes from. Eastern Partnership – as well as NATO expansion – was simply an instrument used to quickly take control over geopolitical territory. The EU was ready to push this project through at any cost. It completely ignored legitimate economic interests of both Ukraine’s neighbors, like Russia and other countries, and even the nations that were part of this program. There have been many studies on this issue. No wonder even Yatsenyuk says that Ukraine needs to take a closer look at the economic section of this agreement. The same will happen with Moldova. They are doing their best to sign a similar agreement with Moldova this summer, before the upcoming election. And this agreement they intend to sign with Moldova – it completely ignores the issue of Transnistria. It ignores the 1997 agreement between Chisinau and Tiraspol which entitled Transnistria to international trade. It ignores what is happening with Transnistria today: Chisinau and the new Ukrainian authorities have basically blockaded the territory. But our European partners keep mum about that. In fact, the European Union and, I think, the United States approve of this policy. We want to talk to them very seriously about that, because they are escalating tensions over Transnistria, almost claiming that it will be next. This is outrageous, provocative rhetoric. Actually, they want to create unbearable conditions for Tiraspol in violation, I repeat, of the agreements which entitled Transnistrians to certain travel, transit and trade rights. This is outrageous. They never learn. Once again, they seek to create a sore point in our relations. Q:Almost all the statements regarding sanctions, including those made by the EU and the US official political institutions, contain the phrase “further escalation.” By “further escalation” my Western colleagues mean that Russian military forces may cross the borders of the mainland Ukraine and move toward Kharkov, for example. Will this happen or not? SL: President of Russia Vladimir Putin in his address given on March 18 in the Georgievsky Hall said clearly that we are very concerned with the situation with Russians and Russian speakers in eastern and southern Ukraine, especially after various Right Sector groups, a certain Beletsky and the Eastern Front rushed there. Those are absolutely odious people. You don’t need to be a physiognomist to be able to tell what their intentions are. They speak openly about that. 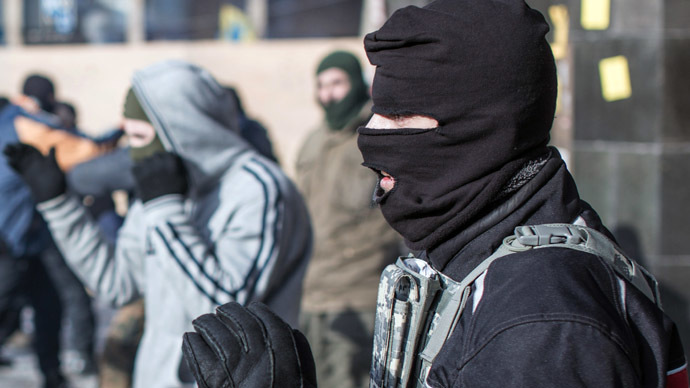 Many leaked phone calls indicate how Russians will be treated in Ukraine not just by the Right Sector members. The Russian president demanded that Ukrainian authorities and their Western patrons take immediate action to stop the violence. He said we are going to protect the rights of Russians and Russian speakers in Ukraine using all the political, diplomatic and legal methods. I have nothing to add to that. We need to be honest. You cannot just say like many times before – regarding Syria, Iran, etc. – that we have come to a crisis and that we just need to accept the reality. Russia is to settle the Syrian crisis, to solve the Iranian problem and to resolve the situation in Ukraine through direct talks with the Ukrainian authorities. The West is consistently trying to avoid the responsibility of dealing with those whom they nurtured and continue to support for their geopolitical purposes. We have absolutely no intentions of crossing Ukrainian borders. This is not in our interests. We simply want everybody to work together; we want the violence to stop and we want the Western countries who are trying to sweep under the rug those cases of violence and to portray the situation in Ukraine in a positive light to realize they need to bear the responsibility. 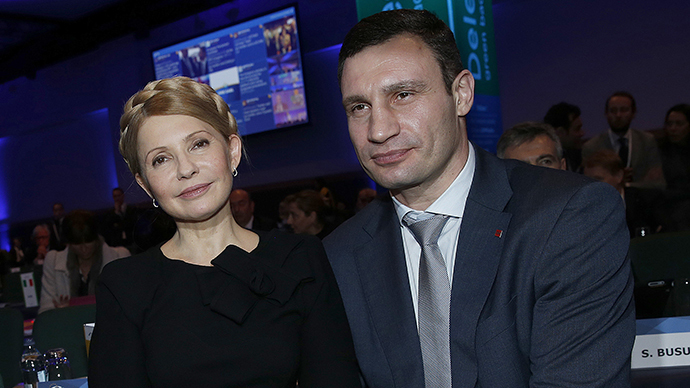 According to Ukraine’s Interior Minister Arsen Avakov, the Ukrainian authorities lately have been trying to disarm all those who possess firearms illegally – that is, the criminals. If this is the result of our Western partners’ efforts, then, I repeat, we are satisfied with that. We are ready to continue to work out joint recommendations for the Ukrainians to stop all the lawlessness and to start a deep constitutional process to reform their country. Q:There are speculations that Russia may respond to all these events by setting up its military bases in the Seychelles, Vietnam, Nicaragua, Cuba and even in Argentina. SL: This is a complete lie. We have no plans whatsoever to build naval and military bases abroad in the sense which you put into the term. The Russian Navy is now much stronger than before. 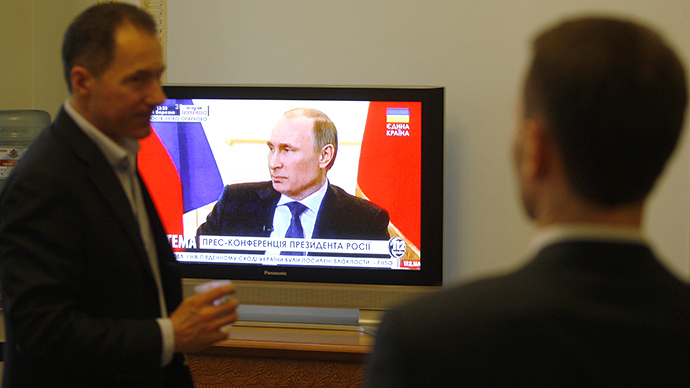 I believe after Crimea joined Russia, it will have much more opportunities for development. Along with the Black Sea Fleet, we also have the Pacific, the Northern Fleet, etc. It’s very important for a country to have highly trained Navy, especially because today the Navy has not just to plough the ocean for training purposes but also to complete specific tasks like counter-piracy operations in the Gulf of Aden and elsewhere. Ships have to travel to remote places. We have agreements with some countries allowing our vessels and warships to use their existing infrastructure for servicing, minor repairs, water and food replenishments and for the crew to rest. We are absolutely not considering building bases similar to how America does it. And of course, unlike the US, we will not have any agreements, which would make our personnel immune to criminal prosecution in the countries where they are deployed. Q:Are you talking to the countries I mentioned about the possibility of our warships entering their seaports? SL: There are a few countries we are talking to but these issues are handled by defense ministries.